A dirt bike rider who broke his neck, fractured his spine and suffered other injuries in a collision with an NYPD car in the Bronx a few weeks ago has filed a notice of claim against the city, but the police department, in the midst of a citywide crackdown on illegal dirt bikes, says he was in the wrong. Gerardo Aguilera, 29, was returning home with dozens of his dirt bike riding friends from a memorial ride for another friend who was shot by police in 2010 when he says two police cars came out of nowhere and one struck him. "Next thing I know was two marked cars coming at a high rate of speed," Aguilera says. "One car stopped, the second car didn't. He hit me. I went flying over a gate; I hit one of the big containers and landed in the woods." Aguilera, who remains hospitalized, said he broke his neck, shattered his femur and was left with broken ribs, a fractured spine and a cracked collarbone. The NYPD says he was speeding and that he drove southbound in the northbound lane and drove into the squad car. Two of the cops in the vehicle suffered minor injuries, and Aguilera was charged with reckless endangerment. The man's attorney, Michael Braverman, calls the cops' actions reckless. "All the police had to do was stop their vehicle. Instead, what we see is an intentional act, slamming a guy who is defenseless on a bike." Aguilera says he wasn't doing anything "crazy" at the time of the accident. "We were just riding down Webster Avenue. Weren't popping wheelies or nothing. I was on four wheels," he said. But police say Aguilera was riding illegally. New York state law prevents off-road bikes and ATVs from registration for street use. And the NYPD says it is cracking down on illegal dirt bikes: Seizures are up 52 percent over last year, with 1,817 off-road bikes and ATVs confiscated around the city as of late October, according to police officials. 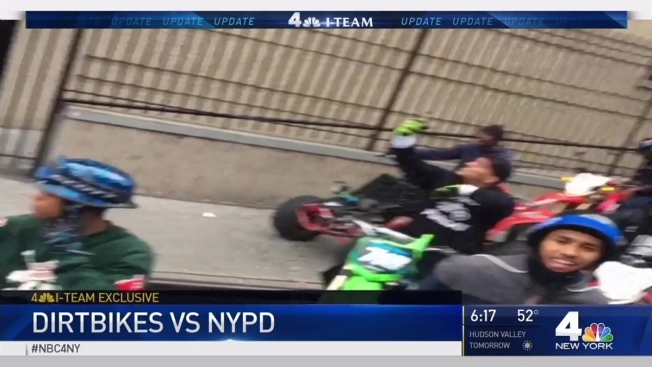 Police consider the illegal dirt bike riding a menace to pedestrians and other drivers. The I-Team spoke with several residents who described having to leap out of the path of dirt bikes as riders drove recklessly on city streets.